Latest Biotechnologist story returned from Historical City..
What a fantastic day to start again my latest post! This the first post of the new year of 2009, the year that will promise me with many kind of stories to tell! About a week i leave my blog without no latest update, and so now here come again. My friend keep demanding on me to update my blog, id. I do not know why for the last several days i lost my appetite to write it. Nevertherless, this post i come out with my last chapter of my activity during holidays: a great adventrous activity i considered. Some memoirs in front the Institute, First arrival.. The journey to the South of Peninsular Malaysia took me about 10 hours to arrive to my destination, Melaka Central. Sitting alone in the bus made me so helpless, lost my mind to do nothing. Yet, arrived at Melaka Central, it gave me out a new high expectation. My activity, CAS activity had been conducted in Melaka Biotechnology Institute. A place where people do researches and manage the biotechnology's policy, under the state government of Melaka. The first day, we, I mean include my friends, Kepet, Nas, Syafik and some girls: Atiq (atikah), Heidi, Farahin, and Ryna, all of us together were introduced to the staffs there. 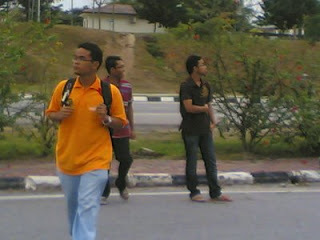 We were guided by a nice guy, name Amirul Faiz. He was so nice and lets us to be familiar with the place. After that, our task began. We were asigned to check all the inventory in the labs there. There were many labs like phytochemistry lab, microbiology lab, Natural Product lab and other labs that i could not remember. But then, we divided ourselve into several group to perform the task of the day. The task was quite easy, it was just like to an audit, but not the real one, just to make sure all the stuffs like the apparatus and the chemical substances in the labs are checked and exist. Watch out! Which way you should observe for moving cars??? Four cute girl posed inside the GreenHouse, will they affect the growth of the plants?? Came on! Faster, Snap me, This is heavy!!! There, we watched how the raw material like the herbs for example Citronella sp. or Serai Wangi being processed to obtain its essential oil. 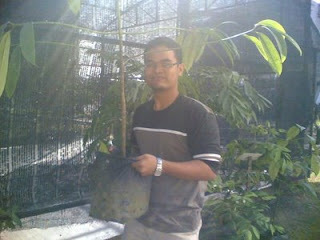 One of the worker told us, by only 20 kg of Citronella leave, we supposely would get only about 50 ml of its essential oil!!! What???!! Haha, that's why the extraction of essential oil really complicated and cost high. How does it work??? See, Nas was astonished..
Oh Boy, you cannot take picture here please, OOps! Snap! Gotcha! On the third day, Iskandar arrived. He had some business to do, hence came there late. We had no clear job to do, just hanged out in the lab to finish up our inventory check list. Then, an idea came out: we decided to go for a visit and skip the task of the day, we moved on to bandar Hilir, a famous place to the most of tourist. There we took the chance to enjoy the new product of Melaka Tourism which is Taming Sari Tower. Just RM 10 per head!! But then we were still unfortunate to get low price ticket since no one of us brought the ID card of Mara College Banting, If not We would get only RM 8 only per head..
Moving up to the top of Taming Sari Tower, 110 metre above the sea level. I wanna be a great traveller, i will come here again..
" The night is still young" Said Syafik. So what?? We spent our time enjoying there till the midnight. Lucy day, bad night. There was no bus to lift us away. Fortunately, there was a kind taxi driver which took us a lift back home. Heidi, doing her job nicely in the lab..
On the fourth day, it was a Christmas Day. So, We did not have any activity. Just laying around and playing game. Nas return home earlier due to his personal business. What was Syafik doing?????? Online? YM? or CS?? Last day, the D-day to submit the Inventory Checklist to Abang Amirul Faiz. After printing all the document, we dismmised. So, Kepet played his role again, send us to Melaka Central. My Bus departed sharp on 10.25 o'clock in the evening. What an enjoyable trip to Melaka!!!! I will be back there again one day! And what was Kepet doing????? Machine controller??? This is we call as Helicopter Bread, reall wanna fly!! yard, rina tu dia sorang ja medic..
then ada sorang agi medic, iskandar..
ahu, kira ok pe.. dia rajin tu..
neway of coz la dia dpt byk experien..
semua tempat ada ahuyy, yard n syamil..
haha, ahuy ngn yard tu ok lagi, syamil tu jer xley bla..
hohoho... good adventure travel blog bro.. Keep it up.. Malacca is a best place to visit and work right..? hahaha.. at least I think it is.. If you guys in Malacca next time, let me know, we can hang out, chit chat, share experience and so on..
euu btol tu amin. rina si rajin. haha. to ahuyy! 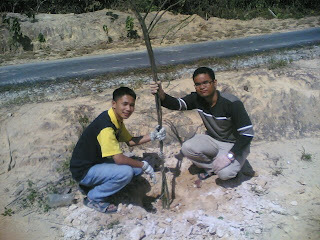 jeles lak kau. haha.wek.